Comm Eye Health Vol. 10 No. 22 1997 pp 32. Published online 01 June 1997. Togo, West Africa, has a population of about 4.0 million. Glei is a small town about 1.5 hours north of Lome, the capital, with a Seventh-Day Adventist Eye Hospital. In a 3 year (1993-95) prospective study, bilateral (n = 5954) or unilateral (n = 2601) blindness (visual acuity less than 3/60) was documented in 8,555 patients. The causes are given in Table 1. 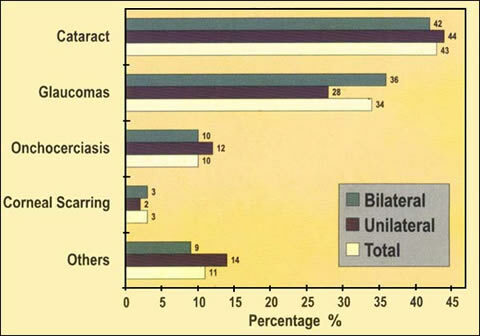 Cataract is the major cause of blindness (42.7%), followed by the glaucomas (33.7%). Glei is in the South of the country and most of the blindness from onchocerciasis, trachoma and vitamin A deficiency is seen in the North. Table 2 subdivides the causes of corneal scarring into trachomatous and non-trachomatous. During the same 3 year period 885 extracapsular cataract extractions with posterior chamber IOL and 291 trabeculectomies for glaucoma have been performed. The major barrier to increasing the numbers of operations is cost. Action is now being taken to provide subsidised surgery for blind cataract patients by obtaining more fees from less essential eye surgery and services.